Now I have posted my powder update, I can do a 'real' post. Here is Chemistry 510. I haven't see an Ozotic version yet, maybe one will come out with the release of the new bottles that piCture pOlish wrote to subscribers about (if wondering what I'm talking about, scroll to the bottom to see a pic). 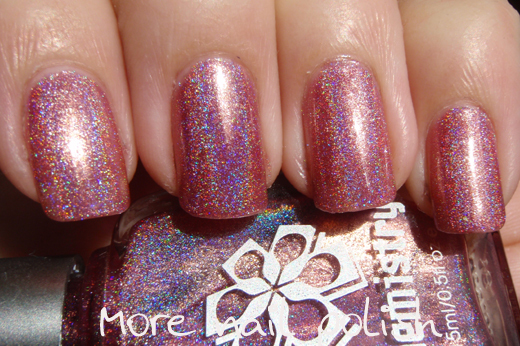 Chemistry 510 is a browner toned pink (yep another pink holo). 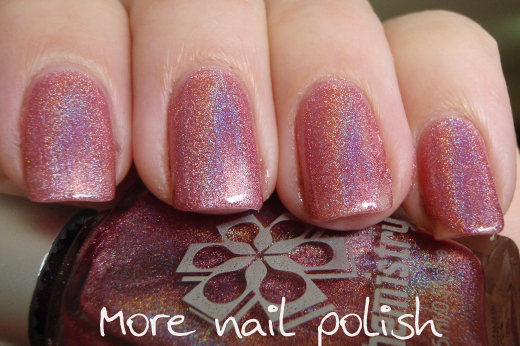 The easiest way to see how it compares to the other pink holos, is to check my Ozotic/Chemistry colour guide. I really love this shade. 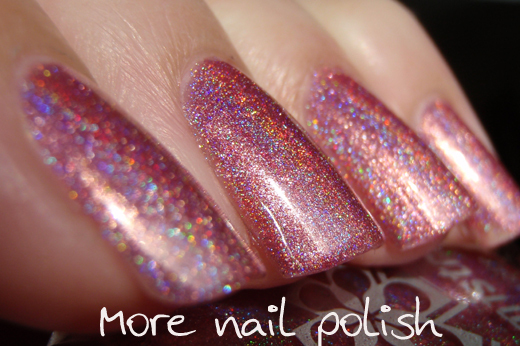 It has heaps of holo goodness and it's a great pink if your not in a really 'lolly pink' mood. Here is my favourite photo angle for holo polishes. Focused on the second nail, the others go out of focus, so you get to see blury sparkles and what it usually looks like, all in one shot. Now the zoomed in shot. Zoom, zoom a zooma zoom zoom. (can you tell I have a three year old?) The beginning goes "up in the air I fly...."
Indoors, you can still see the subtle holo effect. 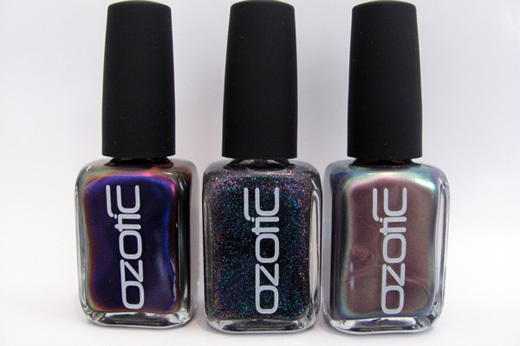 As mentioned above, here are the new Ozotic bottles - I love them, just imagine how well they will stack!! Photo from piCture pOlish. The new bottles are 15ml (instead of 16ml) and now cost $14 ($1 saving). But they are also having issues shipping internationally at the moment, so if you need details I suggest you contact them. Nice holo! The new ozotic bottles look awesome! Oooh 510 is so pretty!! Claire - I would have thought that PP (being a business) had obtained a dangerous good license, but it doesn't look like it. I didn't realize they were shipping with Aust Post overseas. I wonder if they got a warning letter or a fine like some other bloggers have got? I bet the new postage charges will be more expensive for overseas ladies! Great holo! Looks great on your nails! Love the photos!